You will be pleased with the selection of Boca Raton hotels that are on or close to the beach and available in different price points. Families searching for luxury will be happy at the Boca Raton Resort, A Waldorf Astoria Resort or the Boca Beach Club, A Waldorf Astoria Resort where you will find unlimited resort style amenities including golf courses. Upscale travelers will enjoy the accommodations at the Wyndham Deerfield Beach Resort and the Waterstone Resort and Marina Boca Raton, Curio Collection by Hilton has a marina for boat travelers or stay at the upscale Embassy Suites by Hilton Deerfield Beach-Resort and Spa which sports all-suites and complimentary breakfast. When you are looking for a value option then you should stay at the Ocean Lodge which has full kitchens or Comfort Inn Oceanside where you will find waterslides for the children. 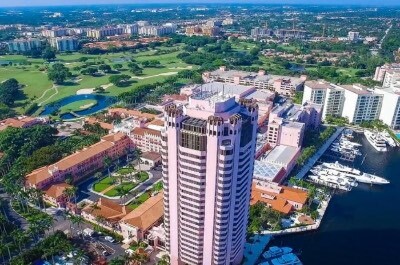 When you are searching for a luxury family-friendly Boca Raton hotel that boasts numerous onsite resort-style amenities such as golf and tennis, has a shuttle to a private beach as well as a marina then the Boca Raton Resort, A Waldorf Astoria Resort is superb. Located along the Intracoastal Waterway overlooking Lake Boca, the Boca Raton Resort, A Waldorf Astoria Resort is situated on 365-acres of lush tropical gardens and is less than 2-miles away from the Gumbo Limbo Nature Center. The Boca Raton Resort, A Waldorf Astoria Resort is composed of a 1926 Renaissance Revival complex of buildings as well as a modern eleven story tower building that contains 835 rooms and suites that feature three distinctly different elegant interiors. Estate rooms in the older Cloister buildings are 380 square feet and one-bedroom Estate suites have 760 square feet with a choice of bedding, a separate living room and garden views. Tower rooms are 560 square feet and Tower junior as well as one-bedroom suites ranging in size from 750 to 1,100 square feet. Yacht Club junior suites have 600 square feet with a choice of bedding, a separate living room, upgraded resort amenities and views of the waterfront. One-bedroom Concierge level suites are 1,300 to 2,400 square feet with a separate living room, dining room and waterfront views (some have kitchens and balconies). One and two-bedroom Bungalows range in size from 995 to 1,345 square feet with a separate living room, full kitchen and private balcony. The Boca Raton Resort, A Waldorf Astoria Resort has a free water taxi shuttle to take you to the Boca Raton Beach Club (sister property) where you can enjoy the sand and surf as well as a marina for your boating pleasures. The property has a kid’s club for children and there are numerous onsite amenities like two 18-hole golf courses as well as 30 tennis courts. The Boca Raton Resort, A Waldorf Astoria Resort has four freshwater swimming pools including an adults-only pool, a FlowRider wave system, shopping boutiques, 2-fitness centers and a full service spa. Dining includes eight onsite restaurants with cuisine that ranges from burgers to sushi to Italian specialties to gourmet fusion dishes. Nightlife at the property includes a lively atmosphere at Mizner’s Monkey Bar and Bocce Garden as well as Bar Luna. The Boca Beach Club, A Waldorf Astoria Resort is an elegant choice for a Boca Raton hotel near the beach that boasts direct beach access, numerous amenities onsite as well as access to a sister resort’s amenities and has a laidback atmosphere. Located 1.5-miles from downtown Boca Raton overlooking the Atlantic Ocean, the Boca Beach Club, A Waldorf Astoria Resort is situated directly on a half mile of private beach and is 1.5-miles away from Mizner Park. 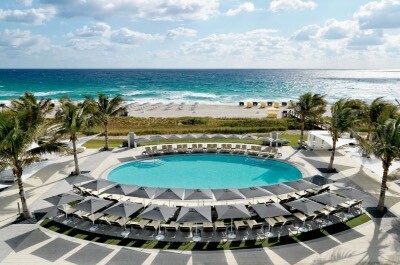 The Boca Beach Club, A Waldorf Astoria Resort has a modern high rise architectural design with 212 rooms and suites that feature a trendy chic interior. Standard and Ocean Vista rooms are spacious with a choice of bedding, floor to ceiling windows and views of the resort or Atlantic Ocean. Pool view rooms are 420 square feet with a choice of bedding, sitting area and large balcony that offers views of the pool area. Poolside Lanai rooms have 500 square feet with a choice of bedding, floor to ceiling windows and a 180 square foot patio that has direct pool access. Oceanfront Sky Deck rooms are 420 square feet with a choice of bedding, floor to ceiling windows, a sitting area and a 250 square foot balcony that boasts oceanfront views. One-bedroom oceanfront suites are sized at 850 square feet with a separate living room that has a sofa sleeper, floor to ceiling windows, dining area, 1.5-bathrooms and oceanfront views. The Boca Beach Club, A Waldorf Astoria Resort has a great half mile of private beachfront where you can lounge and there are plenty of watersport activities available for rent. The property has a kid’s club with organized activities for children throughout the day. The Boca Beach Club, A Waldorf Astoria Resort offers a water taxi shuttle to the Boca Raton Resort and Club where you will find more amenities such as four swimming pools, two fitness centers, two 18-hole golf courses and 30 tennis courts. The resort has three freshwater swimming pools including a lap pool, a fitness center and full service spa. Dining incudes the Seagrille for all three meals as well as Beaches Cafe and Bar for lunch. You also have access to several restaurants at the sister resort by way of complimentary shuttle. Nightlife includes a drink at the Ocean Bar and you can try the Biergarten Boca Raton or Havana Nights Cigar Lounge. When you are seeking a mid-range upscale Boca Raton hotel that has a lively atmosphere, a marina, a free shuttle to the beach and is great for all types of travelers then the Waterstone Resort and Marina Boca Raton, Curio Collection by Hilton is superb. Located along the southern shoreline of Lake Boca, the Waterstone Resort and Marina Boca Raton, Curio Collection by Hilton is a 5-minute walk to South Inlet Beach and is 2-miles away from the Gumbo Limbo Nature Center. 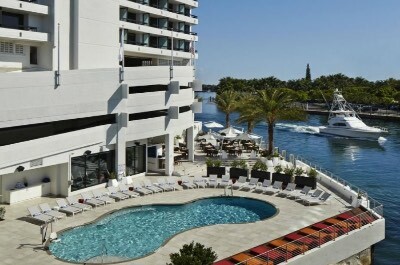 The Watersotne Resort and Marina Boca Raton, Curio Collection by Hilton has a modern eleven story architectural design with 139 rooms and suites that feature an artsy contemporary interior. Rooms are sized at 362 square feet with a choice of bedding, floor to ceiling windows and a private balcony with Intracoastal Waterway, Lake Boca or Atlantic Ocean views. One-bedroom suites are 724 square feet with a separate living room, wet bar, floor to ceiling windows and a private balcony that features views of Lake Boca, the Intracoastal Waterway or the Atlantic Ocean. The one-bedroom Presidential suite is 1,086 square feet with a separate living room that has a sofa sleeper, wet bar, 2-bathrooms, floor to ceiling windows and two balconies with sweeping views of the area. The Waterstone Resort and Marina Boca Raton, Curio Collection by Hilton offers a free shuttle to attractions within a 3-mile radius which includes South Inlet Beach where you will find complimentary beach equipment and you can rent your favorite watersport equipment or adventure through the onsite marina. The property is perfect for adventuring to several attractions which are within 2-miles that include the Boca Raton Historical Society and Museum, the Children’s Museum of Boca Raton and Mizner Park. The Waterstone Resort and Marina Boca Raton, Curio Collection by Hilton has a freshwater swimming pool with a sundeck that overlooks Lake Boca, a fitness center and a marina. Dining onsite includes Boca Landing for breakfast and dinner service as well as the Waterstone Rum Bar and Grill prepares lunch and dinner. Nightlife includes live music on the weekends at the Waterstone Rum Bar and Grill or you can go to Platforms Nite Club for club dancing and the Funky Biscuit has live music. If you are looking for a mid-range Boca Raton hotel that offers all-suite accommodations, is near the beach and boasts value with a free breakfast, then the Ocean Lodge is ideal. Located 1-mile from downtown Boca Raton along the Atlantic Ocean coastline, the Ocean Lodge is steps away from a white sand beach and is within 0.5-miles to Gumbo Limbo Nature Center. The Ocean Lodge has a modern two floor architectural style with 15 suites that have a contemporary decor. The White Sands suite is the smallest with an integrated open floorplan that has a queen size bed, sofa sleeper, full kitchen and views of surrounding area from picture windows. The Ocean Breeze Deluxe suite is slightly larger with an open floorplan that includes two queen size beds, a sofa sleeper, full kitchen and views of the ocean from picture windows. The Royal Palms suite is the largest with an open floorplan that has two queen size beds, a full kitchen, sofa sleeper and views of the surrounding area. The Ocean Lodge Boca Raton Hotel has an ideal spot across from the beach where you will find lots of sand, swimming and various watersport activities are available through vendors. The property is perfect for exploring with several attractions within an easy walking distance which include Red Reef Park, South Beach Park and you are less than 1-mile from the Boca Raton Museum of Art. The Ocean Lodge has a freshwater swimming pool with a sundeck and a barbeque grill area. Dining includes a complimentary continental breakfast and a leisurely home cooked meal in your suite. Offsite dining within a short distance is plentiful with M and M Thai Restaurant, Trattoria Romana prepares Italian cuisine and the Boca Beach House serves seafood. Nightlife within a short drive includes the Mizner Park Cultural Arts Center or listening to live jazz at the Jazziz Nightlife. The Embassy Suites by Hilton Deerfield Beach-Resort and Spa is an upscale Boca Raton hotel on the beach that offers all-suite accommodations, has easy beach access and offers value for families with complimentary breakfast as well as an evening reception. Located 4-miles south of Boca Raton in Deerfield Beach overlooking the Atlantic Ocean, the Embassy Suites by Hilton Deerfield Beach-Resort and Spa is situated across the street from a white sandy beach and is less than 1-mile south from the Deerfield Beach International Fishing Pier. The Embassy Suites by Hilton Deerfield Beach-Resort and Spa has a modern seven story architectural design with Spanish Revival accents that contains 244 one-bedroom suites that feature a contemporary interior. All one-bedroom suites have a choice of bedding, a separate living room that has a sofa sleeper, a wet bar, a small kitchenette (microwave and refrigerator), floor to ceiling windows, multiple bathroom units are available and a Juliette or step out balcony that offers views of the city, ocean or oceanfront. 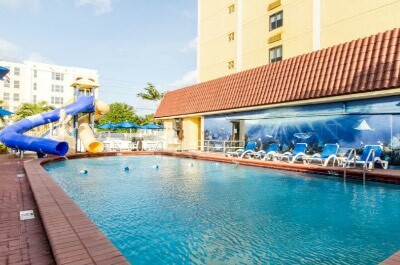 The Embassy Suites by Hilton Deerfield Beach-Resort and Spa is less than a 5-minute walk to the beach where you can find beach and watersport equipment rentals as well as plenty of room to lounge. The property is a great place to start your adventures of the area with less than 4-miles to attractions such as Red Reef Park, the Boca Raton Museum of Art and the Deerfield Beach Boardwalk. The Embassy Suites by Hilton Deerfield Beach-Resort and Spa has a freshwater swimming pool with a sundeck that overlooks the Atlantic Ocean, a fitness center and a full service spa. Dining includes a complimentary breakfast and an evening social hour with complimentary food and drinks. There is also BT’s Oceanfront Restaurant that serves lunch and dinner onsite. Offsite dining choices within an easy walk includes JB’s on the Beach for seafood, Two Georges at the Cove and Little Havana Restaurant prepares Cuban cuisine. Nightlife requires a short drive to Packy’s Sports Pub for live music as well as Jazziz Nightlife or you can watch a movie at the Muvico Broward 18 Theater. 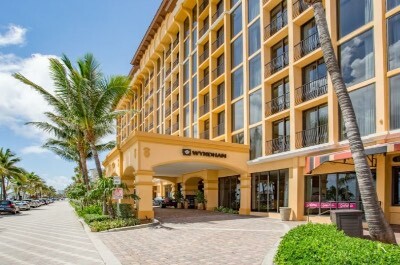 If you are searching for a Boca Raton hotel that has a lively atmosphere with plenty of family-friendly amenities and is on the beachfront then the Wyndham Deerfield Beach Resort is superb. Located 3.5-miles south of Boca Raton along Deerfield Beach overlooking the Atlantic Ocean, the Wyndham Deerfield Beach Resort is steps from the white sands of Deerfield Beach and is less than 4-miles to Red Reef Park in Boca Raton. The Wyndham Deerfield Beach Resort has a modern eight floor architectural style with 172 rooms and suites that sport a contemporary decor. Rooms are 300 square feet with a choice of bedding and floor to ceiling windows that boast a city or oceanfront view. Corner rooms have 400 square feet with a choice of bedding and floor to ceiling windows that offer a view of the city or oceanfront. Suites are sized at 500 square feet with an integrated living and sleeping area that has a sofa sleeper, wet bar as well as floor to ceiling windows that have a city or oceanfront view. The Wyndham Deerfield Beach Resort is less than 35 steps away from the white sands of Deerfield Beach where you can relax, swim and there are plenty of watersport opportunities available from vendors. The Wyndham Deerfield Beach Resort overlooks the Deerfield Beach International Fishing Pier, is an easy walk to the Deerfield Island Park and you are only 3.5-miles to the Gumbo Limbo Nature Center. The property has a freshwater swimming pool and a fitness center. Dining at the property includes Cafe Med Ristorante for all three meals, the Patio Bar and Grill serves lunch and dinner as well as BurgerCraze. Offsite dining options that are within a short distance include Flanigan’s Seafood Bar and Grill, the Deerfield Beach Cafe has comfort dishes and the Crepe Cafe prepares French specialties. Nightlife is packed at the Wyndham Deerfield Beach Resort with live music at the Patio Bar and Grill as well as Cafe Med Ristorante. The Comfort Inn Oceanside is an ideal family-friendly value oriented Boca Raton hotel on the beach that offers a complimentary breakfast, a fun pool area and is close to several attractions. Located 4-miles south of Boca Raton in Deerfield Beach, the Comfort Inn Oceanside is 1-block away from the shoreline of the Atlantic Ocean and is less than 4-miles to the Gumbo Limbo Nature Center. The Comfort Inn Oceanside has a modern six story architectural design with 69 rooms that feature a modern interior. The Comfort Inn Oceanside has spacious rooms that offer a choice of bedding, small kitchenette (microwave and refrigerator) and floor to ceiling windows with a view of the surrounding area. The Comfort Inn Oceanside Boca Raton Hotel is just minutes away from a white sand beach where you can find plenty of watersport activities and space to lounge. The property is within walking distance to many attractions such as 2-blocks to the Deerfield Beach International Fishing Pier, Deerfield Island Park and you are 4-miles away from the Children’s Science Explorium. The Comfort Inn Oceanside has a super freshwater swimming pool with two waterslides and a sundeck with a poolside bar, barbeque grill area as well as a fitness center. Dining onsite includes a complimentary breakfast with numerous dining options within a short walk that include the Whale’s Rib for seafood, Amante Italian Cuisine serves Italian specialties and Casa Maya Grill prepares Mexican dishes. Nightlife within a short distance includes a cold drink at Tipperary Pub Inc., catching the game at Bru’s Room Sports Grill or you can take a short 3-mile drive to the Mizner Park Cultural Arts Center for a live performance.